Although sharks have a reputation as destructive beasts that attack almost anything that enters their water habitat, the actual number of shark attacks is probably lower than you imagine. There are many different types of sharks including the great white shark, hammerhead shark, bull shark, tiger shark and mako, they all offer varied and interesting information so read on and enjoy our cool shark facts. Sharks do not have a single bone in their bodies. Instead they have a skeleton made up of cartilage; the same type of tough, flexible tissue that makes up human ears and noses. Sharks have outstanding hearing. They can hear a fish thrashing in the water from as far as 500 metres away! 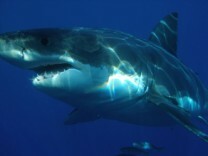 If a shark was put into a large swimming pool, it would be able to smell a single drop of blood in the water. Although most species of shark are less than one metre long, there are some species such as the whale shark, which can be 14 metres long. Not all species of shark give birth to live pups. Some species lay the egg case on the ocean floor and the pup hatches later on its own.